The best car you never remember exists. The Toyota Avalon is a good car. It consistently ranks high in customer satisfaction surveys, as well as at the very top of Consumer Reports rankings of large sedans. But none of this makes it particularly exciting, and it is not a car that has ever been accused of being too flashy. The fourth generation Avalon moved to fix that problem, and the facelifted 2016 model that was just unveiled at the Chicago Auto show refines that look even more. The changes are not drastic, but they are most noticeable in the front fascia, where the grille and lights have been redesigned. Around back, the taillights have also been reworked and there is some new chrome on both the front and back. The top Limited trim gets new 18-inch chrome wheels. The engine is still the same 268 horsepower V6 and the interior is the same save for a new 7-inch optional infotainment system. 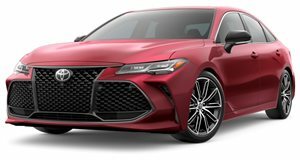 The changes aren't huge, but Avalon sales have picked up quite a lot since the introduction of the fourth generation, and Toyota clearly don't want to tamper too much with success. It might as well be driving itself. No doubt it will be in the next few years.